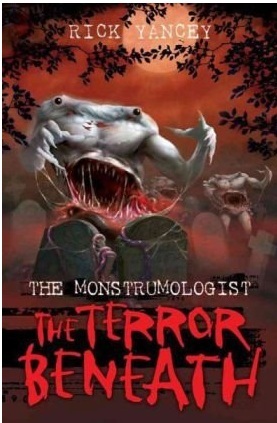 The Terror Beneath (The Monstrumologist #1) – Rick Yancey. So starts the diary of Will Henry, orphan and assistant to a doctor with a most unusual specialty: monster hunting. In the short time he has lived with the doctor, Will has grown accustomed to his late night callers and dangerous business. But when one visitor comes with the body of a young girl and the monster that was feeding on her, Will’s world is about to change forever. The doctor has discovered a baby Anthropophagi–a headless monster that feeds through the mouthfuls of teeth in its chest–and it signals a growing number of Anthropophagi. Now, Will and the doctor must face the horror threatenning to overtake and consume our world before it is too late. A note: I promise the follow is actually a review and not my application for the position of President of the Rick Yancey fan club. When I was younger I never believed in monsters. I like to think it was because even then I was a little clever clogs who knew that monsters didn’t exist and believing in them was for babies. Because while most children were checking in their wardrobes and under their beds for monsters, I was convinced my house was haunted and that a ghost was going to eat me and/or possess me. My house, for the record, was only built about thirty years ago and stands at the foot of the Pennines, not on an evil cemetery. Although there have been rumours that, like at Hadrian’s Wall, you can hear the sounds of marching Romans on cold, quiet nights…. Um… what was I on about? The truth: I always thought that monsters were stupid. They were stupid because they could never exist. Huge creatures who lived under my bed with slobbering, gnashing teeth? The only things under my bed were books in boxes from Ikea and an alarming amount of odd socks and Crayola pencil crayons. And the Bogey man lurking in my wardrobe, ready to creep out when I was tucked up in bed? The only monster in my wardrobe is the Furby I given when I was seven and when the novelty wore off and it wouldn’t shut up, I shoved it, swaddled in an old t-shirt, into a shoe box and flung it in. But The Monstrumologist was not the book that I was expecting. Don’t get me wrong, I was dying to read it because in my head it was a story about a cute boy running around with a cantankerous old man fighting monsters. Sounds dead lovely, yeah? I thought it would be sweet and funny and I’d enjoy it but then I’d put it back on my shelf and forget about it and calmly move on to the next book. Try forgetting this book in a hurry. A mixture of fantastic setting, brilliantly thought-out characters and relationships and genuinely horrifying action scenes; this book really has it all. This book was vile, it truly was, and I’m not squeamish at all. I love horror films, I love gory films and I’m the sick sicko who watches the needle when the nurse takes my blood. But there were quite a few bits where I almost gagged. Not just pulled a face or though “Ew, that’s a bit gross.” Actually gagged. There was one in particular bit at the end and, yeeerugh, so so grim. So if you’re a bit of a wimp on the more delicate end of the spectrum… there’ll probably be a few parts you’ll skip. Funny I should use the phrase “a few parts”. I can’t help but think if this book was ever adapted into a film (pleasepleasepleaseplease Adaption Fairy!) that, if it was faithful to the book, it would probably be rated as at least a 15. It is gruesome and it is macabre and it is relentless with its horror but never once does it turn gratuitous and I really loved that. It’s clear that Mr Yancey knows how to tell a horror story without resorting to cheap shocks. But what is even clearer is that Mr Yancey can delve deep into human emotion, even the nasty bits, and portray it with startling accuracy and brutal honesty. The relationships and feelings explored in this book, particularly between Will (oh Will, I think we’re going to best of friends. You’re such a badass and I will always pick you for my monster-fighting team) and the doctor, were so beautifully written that I made a note of almost every paragraph in this book. I love the way that Yancey dealt with certain characters and situations but I can’t talk about them because of secret secrets. But I’ll just say this: There are lots of monsters in this book but not all of them have fangs dripping in blood. I adored the prologue and the epilogue, too. Don’t worry, you’re still reading one of my reviews. And yep, I still hate epilogues and will continue to hate them until my dying day. Usually the idea of an author adding himself as a character in his own story makes me feel a little queasy; but not this time. It added a sense of, and yes I’m aware at how stupid this will sound, realism to the whole story. I could absolutely picture Mr Yancey sat in his house, pouring over Will Henry’s diaries, scribbling notes in a notepad and researching places like Deadham and Whitechapel (!!!). There is a part at the end where the character Yancey describes Will Henry’s stories as “fiction” and I got angry. That’s right. I got angry at a fictionalised version of the author denouncing a fictionalised character. Read this book with all the lights turned on. Read this book about an hour after you’ve eaten. Read this book with a wooden stake next to you. Im so so happy you really liked it :D Clearly I rock at choosing gift books! Ha thanks Amy! You really do rock. I bought the second book pretty much straight away.